Ms. Likar has studied the Alexander Technique for over 20 years and received her AmSAT certification and training in 2002 from the Alexander Training Institute of San Francisco, studying with Frank Ottiwell, Robert Britton, Larry Ball, Rome Earle, Simone Biase and John Coffin. 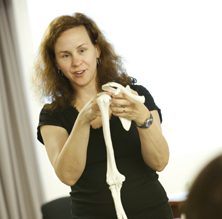 She has also studied the Alexander Technique and Body Mapping over the past 20 years with Barbara Conable. The Alexander Technique is a simple and practical method for improving ease and freedom of movement, balance, support, flexibility, and coordination. It enhances performance and is therefore a valued tool for musicians. Practice of the Technique refines and heightens kinesthetic sensitivity, offering the performer a control which is fluid and lively rather than rigid. It provides a means whereby the use of a part, a voice or an arm or a leg, is improved by improving the use of the whole body, indeed, the whole self. Those who must use their bodies with maximum ease and flexibility–actors, dancers, singers, athletes, and musicians. Those whose carriage is bad, uncomfortable, or painful, or whose occupations lead them into bad postural habits. With the Alexander Technique, these benefits are accomplished by the application in one’s own experience of what Frederick (F .M. ) Alexander called constructive conscious control. Constructive conscious control is a process of self-observation and self-analysis, wherein one becomes intimately knowledgeable about one’s own habits (awareness) so that one can suspend (inhibition) habitual muscular tightening (sometimes called downward pull), where it exists, and gradually consciously replace it with constructive behavior. Often one simply suspends unnatural movement and waits for natural movement to emerge (direction). Natural movement is discovered to be that movement which is most supported and sustained by the body’s whole complex of postural reflexes; including the much prized “Primary Control”, the natural lengthening and gathering of the spine in movement, which depends on a dynamic, initiating relationship of the skull to the spine. Awareness – Through the practice of the Alexander Technique one learns to increase one’s field of attention to include the whole of oneself and one’s surroundings. Through awareness and the assistance of an Alexander Teacher, one can become aware of patterns of tension that may be interfering with overall ease and freedom in the use of the body. Inhibition – Through awareness one can then recognize where it might be necessary to inhibit a response to a particular stimulus in order to achieve greater freedom and ease throughout the entire body. Direction is allowing the natural movement inherent in all of us to emerge. Our bodies want to move well, we just need to learn how to get out of our own way. Your legs can move forward and away (apart) from your torso. Alexander’s directions are not something one does or tries to do but instead are a natural response that will take place in the body when one learns to inhibit a habitual response to a stimulus. British Medical Journal on Alexander Technique.